Ahh, the crock-pot. For some, it’s just another kitchen tool collecting dust in a cabinet. For others, it’s a great way to make roasts or chili. Do you have a crock-pot collecting dust in a cabinet? Or perhaps you bring out your slow cooker a few times a year to make the same ‘ole recipes: maybe a roast or a chili recipe you enjoy. Well, it’s time to liven things up! Crock-pots and slow cookers are awesome tools in cooking. The long cooking times allow ingredients to really blend together, producing deep, savory flavors, while the hands-off approach means you have more time to focus on other things. Plus, these handy kitchen appliances can be used to make healthy versions of your favorite dishes. From breakfast quinoa to pad thai, veggie enchiladas to Greek yogurt, you’ll truly be amazed at what a workhorse they are. And with all these recipes I’ve gathered up, it’ll make it easy to enjoy these healthy crock-pot recipes! So dust off that crock-pot or slow cooker (or get a new top-rated crock-pot), or pull it out of the basement, and get to the kitchen to make some of the best-tasting, nutritious meals you’ve ever had. Apples and cinnamon are a perfect match in this super-simple oatmeal recipe. Skip the brown sugar and use maple syrup or honey instead. When you want a unique hot breakfast, these baked apples — stuffed with raisins, honey and cinnamon — fit the bill. Use an apple corer to speed up the apple prep and set these to cook overnight. This alternative to oatmeal is equal parts sweet and tart, thanks to antioxidant-rich blueberries and lemons. Added flaxseeds give this morning treat even more staying power. Get an early-morning protein blast with this no-sugar added quinoa. Set the crock pot on low before bed to have a hearty breakfast waiting for you when the alarm goes off. Carrot cake and zucchini bread for breakfast? The whole family will love this healthy breakfast! Steel-cut oats will keep you full for hours and fresh carrot and zucchini gives this oatmeal a familiar (and delicious!) taste. Skip the sugar and agave; instead, use natural sweeteners like maple syrup and top with your favorite nut. Get a perfect frittata every time by using your slow cooker. With such a lovely presentation and lots of greens, this is an excellent “breakfast for dinner” dish, too. Oatmeal gets a chocolatey kick in this overnight recipe. Coconut milk keeps it creamy ’til morning. Top with pecans, shredded coconut and a dash of coconut sugar if needed. Why relegate Mexican dishes to dinner when you can have them for breakfast, too? This casserole uses ingredients you likely have on hand for an easy morning meal. Use turkey or chicken sausage instead of pork, or leave it out completely to make this vegetarian-friendly. There’s nothing better than waking up to a ready-made breakfast — especially when it takes just a minute or two to prepare. Enjoy the taste of banana bread in a nutritious oatmeal. Skip the brown sugar and top with maple syrup instead. Wake up to the sweet scents of cherries and almonds with this yummy overnight oatmeal. Crispy edges reveal plump and juicy cherries for a dessert-like breakfast. If you’ve hopped on the pumpkin bandwagon, this is the oatmeal recipe for you. Almond milk, fresh (or canned!) pumpkin and cinnamon infuse the oatmeal with that flavor you love, and the coffee cake topping makes it feel extra special. This quinoa morning casserole is a great dish to serve when you have company or for keeping extras to eat throughout the week. You get all the nutrition of spinach, plus you can add other healthy ingredients like turkey sausage, too! Quinoa and oatmeal create a power protein combo in this hot breakfast. Apricots taste great, but sub in your favorite fruit. Freeze in individual portions for a grab-and-go meal for busy mornings. This slow-cooking omelette forms a beautiful crust as it cooks. Filled with colorful veggies and topped with your favorite garnishes, this one’s a hit. I might be biased, but this bone broth recipe is one of the most healing foods you can make. And, because it simmers for 48 hours in the crock pot, it’s so easy! Make it today to heal a leaky gut, improve your skin or just feel better overall! This hearty beef stew is great on a cold winter night. It requires little prep and is filled with nutritious ingredients, like celery, carrots and sweet potatoes. Yum! This recipe requires a bit of prep — browning the meat and sautéing the root veggies before adding to the crock-pot will add extra flavor — but the end result is worth it. After all, when’s the last time you added rutabaga to a stew? Fresh spices and herbs like star anise, ginger, cinnamon and mint really stand out in this chicken version of the Vietnamese favorite — don’t skip ‘em! Sub coconut sugar for brown sugar and prep ahead to save even more time on busy days. Naturally vegan and gluten-free, this stew uses dried beans and quinoa for a protein-rich stew that comes together in a flash for a protein-rich supper that the whole family will enjoy. Note: The fresher your beans, the more quickly they’ll cook. Mushroom fans, this is the time to get wild. From button to oyster to porcini and shiitake, use your favorite varieties in this creamy soup. Skip the refined flour and opt for gluten-free or coconut flour instead. A minestrone soup loaded with fresh spring goodies, even vegetable haters will enjoy this one. Use rice or gluten-free pasta. Take a break from miso soup and try this light and easy Japanese onion soup instead. Carrots, celery, garlic and onions cook in a broth to load it with flavor and are removed before eating; serve them on the side. Toss in fresh mushrooms and scallions and enjoy. Jump on the kale bandwagon with this healthy soup. It’s easy to alter to your tastes — add or subtract kale, substitute your favorite vegetables, or let it simmer overnight. You’ll still get the benefits of the leafy greens. This loaded lentil soup is anything but boring. It’s full of yummy extras like mushrooms, carrots, fresh herbs and leafy Swiss chard. Skip the bacon or opt for a turkey or beef version instead. Filling, delicious and good for you, this soup hits all the spots. Chicken, beans, kale and quinoa ensure you’ll be satiated for hours while keeping out of the kitchen. This soup has more going for it than just its fun color: It’s also brimming with good-for-you goodness, courtesy of fresh spinach and cucumber. Add quinoa or brown rice to make it even heartier or enjoy as is. If turkey makes it onto your menu only around Thanksgiving, this stew will convince you to incorporate it year-round. Use any parts of the bird you’d like for a classic, meaty stew. If vegetable soup gives you flashbacks to the canned versions, it’s time to make a homemade version. With just a little chopping, you can have a fresh batch of veggie goodness — it’s loaded with onions, carrots, celery, tomatoes, green beans, corn and peas — that’ll put the store-bought stuff to shame. Skip the Chinese takeout and make this homemade version of beef and broccoli instead. It’s healthy, tastes great and is a snap to make. Serve over leafy greens, brown rice or quinoa. Get that buffalo flavor you love without all the “extras.” I love this chicken in the lettuce wrap, but you can also use it in sandwiches, on top of pizzas, sautéed with veggies — use your imagination! No matter who scores the winning points, everyone will feel like a winner when you serve this beefy chili during the big game! Serve with rice crackers or gluten-free tortilla chips. This cashew chicken will satisfy your takeout cravings — and it tastes so much better, too! Rice wine vinegar, palm sugar and ginger make a sticky sweet sauce that coats the chicken. Top with cashews before serving and enjoy! If you’ve been missing Chipotle since eating clean, this slow-cooked chicken will hit the spot. Top with avocado slices and fresh Greek yogurt instead of sour cream. Carrot and zucchini “noodles” are nestled atop coconut milk and chicken stock to slowly cook without getting mushy. Chicken and a host of Thai spices turns this dish into a healthy pad Thai you can make without much effort — or icky ingredients. Chicken gets an autumn feel with the addition of applesauce and sweet potatoes. This is homey, healthy food at its best. This chicken has an extra step — it’ll marinate in a homemade sauce overnight — but the next morning, it’ll cook slowly with no added effort and the end result is worth it. The combo of a dry rub and marinade will leave you with a chicken that’s wonderfully moist and fall-off-the-bone good. This is great for burritos, sandwiches or anything else you need cooked chicken for. A little sweet and super tender, this coconut chicken is a breeze to make — you probably already have soy sauce, coconut milk and cloves! — and makes an excellent main dish. Just be sure to use coconut sugar in place of brown. Perfect for Sunday lunch or supper, this leg of lamb soaks in the rosemary, black pepper, sea salt and garlic flavors it’s cooked in. Add your favorite veggies — like carrots, potatoes, onions or squash — to cook alongside it. Put oft-forgotten cabbage to work in this shredded beef dish. Browning the beef first adds a ton of flavor and after it finishes cooking in the slow cooker, you’ll make a delightfully spicy slaw with the cabbage. Use any extra beef in sandwiches, tacos and more! When you have chicken burnout, turn to the other bird. This turkey breast has loads of flavor and is perfect to add to your favorite recipes or to serve with a side of veggies. Use fresh herbs for an even more intense taste. 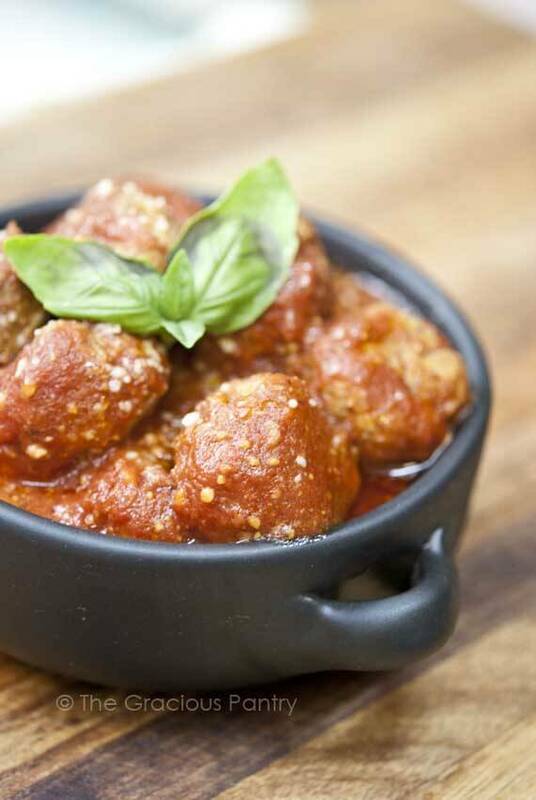 These meatballs are perfect to add to your favorite brown rice noodle dish, in an Italian sandwich or atop a salad. You’ll be surprised at how moist the lean ground turkey stays throughout cooking. Get a main dish and side all at once with this lemon rosemary chicken. I love the suggested mushrooms and potatoes, but use whatever veggies are on hand to make this super simple. Make picture-perfect sticky chicken with this easy recipe. Make the sauce on the stovetop first (use coconut sugar!) and let the drumsticks soak and cook with it slowly. Serve with brown rice or vegetables — yum! Get restaurant-worthy teriyaki chicken with little effort and all-natural sweeteners (just use arrowroot flour in place of cornstarch). Whether you put it on a salad, in a sandwich or just devour it solo, it’s a hit! Just two ingredients cooking for several hours will produce some of the best chicken you’ve had. Make this now! These vegetarian homemade enchiladas come together. Keep them simple with just beans and corn or add even more veggies. Use gluten-free or sprouted grain tortillas and enjoy this classic Mexican dish. Make a tasty pizza right in your crock-pot — plus, there’s no kneading dough or waiting for it to rise with this cauliflower crust. I recommend making your own Alfredo sauce or using your favorite homemade pizza sauce in its place. Forget calling out for pizza! Cumin and cinnamon lend this dish an exotic flavor. It’s inexpensive, easy to make and, most importantly, tastes amazing. This veggie chili will give meat versions a run for their money. With just a few pantry staples, you’ll have an awesome meal to eat on its own or atop a baked potato. It’s perfect game-day food! This stroganoff is comfort food at its finest. Use Greek yogurt in place of sour cream for a creamy sauce that’s awesome over brown rice or gluten-free pasta, quinoa, or rice. Use your slow cooker for fool-proof salmon every time. Use your favorite fresh herbs and serve with lemon wedges. It doesn’t look too fancy but oh boy! This dish is packed with savory tastes, and it tastes even better as leftovers. It’s an interesting new way to use pumpkin and jazz up boring old curry. Be sure to use all the spices for the best taste. This is truly a dump-and-go recipe. Toss in whatever veggies you have available, add beans for even more protein,= and let dinner make itself! Try this unique spin on tacos starring quinoa and lentils. These will fill you right up and the leftovers are just as good! Indian dishes are super veggie-friendly, and this one is no exception. Curry paste, garam masala and coconut milk give this a distinctly Indian flavor and the lentils soak it all up. Use coconut sugar instead of brown and you’re good to go. A crazy simple recipe for busy days, this dish is a complete meal that requires no prep — and the sauce is to die for! This Italian dish is an excellent choice when you want a homemade, hands-off pasta sauce. Tomatoes and veggies cook slowly to make a flavorful sauce, and brown rice spaghetti gets added in towards the end to cook right in the sauce, making this a true one-pot meal! A little prep yields a protein-rich, hearty Tex-Mex meal that’s great for serving large groups or eating leftovers. Sweet peppers and poblano chili peppers give this a little extra zest, too! If you eat meat, ground beef would make a nice addition. Butternut squash gives some heft to this vegetarian chili, while chipotle peppers, chili powder and cumin add a spicy, smoky taste. Don’t be surprised if there aren’t any leftovers! This meatless main dish is perfect for sneaking in extra veggies among picky eaters. It tastes so good that the kids will never guess that it’s hiding broccoli, zucchini and mushrooms! Stuffed peppers make eating your vegetables fun! Plus, it’s super easy. Fill them with brown rice or quinoa to keep them filling and healthy. This isn’t your grandmother’s cabbage! These cabbage pockets are loaded with ground portobellos, shallots, rice (make it brown), breadcrumbs (use sprouted or make your own!) and seasonings. The ‘shrooms add a meaty texture — try fooling the meat eaters! Cook artichokes in the crock pot easily. With olive oil and lemon juice (to prevent browning) drizzled over them and garlic added in, you’ll have a tasty side with little effort. Skip unhealthy canned baked beans and make your own! Dried beans soak overnight right in the crock-pot and then simmer the next day until they’re tender and full of flavor. Perfect for your next barbecue! Use brown rice to make this simple side when you serve tacos, burritos or other Mexican favorites. Or add corn, bell peppers and avocado for a whole meal! A healthier version of traditional risotto, this recipe uses brown rice to speed up the process. Serve this as a side for your favorite roast. Brussels sprouts will move to the top of your “favorite vegetable” list after you make them in the crock-pot. Just a few ingredients give this green a savory taste you’ll love. Whether you want an easy side dish or need it for another recipe, this is the simplest — and cheapest — way to get a puree. When you need an alternative to mashed potatoes, subbing in cauliflower is tasty and lightens things up. Try these at your next holiday meal! Whole beans soak overnight in the crock-pot and then cook slowly throughout the day for a yummy bean side. Serve these alongside your favorite Tex-Mex dishes! Too cold to bust out the grill? Make corn on the cob right in the slow cooker to enjoy any time of year. This succotash uses trendy — with good reason! — edamame for a hearty side dish. Make an extra batch and freeze for future use. Crisp, seasoned and good for you, these green beans are a hit. Serve them with your favorite roasted main. Make a large batch of garlicky, herby mashed potatoes while keeping your stovetop free. So good, you won’t miss the gravy! Get a vitamin boost with this sweet potato mashed. It’s meant as a side, but it’s so good you might want to eat it solo! It freezes well for busy weekdays, too. While including a mushroom recipe might seem odd, slow cooking mushrooms gives them a rich taste that makes a wonderful addition to your favorite meals. Sprinkle with fresh parsley before serving. Using dried beans makes this side cheap and easy without the strange preservatives that canned versions use. And there’s no frying! Save time and money by cooking rice in bulk in the crock-pot! You can easily freeze it to always have rice on hand for your favorite recipes. Save space in the oven by roasting vegetables in your crock-pot! They’ll have even more flavor than their oven counterparts and cook without the risk of burning. This spinach and potato-based side dish goes well with your favorite Indian curries. This coconut “spaghetti” is wonderful served alongside Thai dishes — or on its own! Give new life to boring sweet potatoes with this recipe. Honey and allspice give this a warm, sweet taste — it just might be your new sweet potato go-to! Why buy expensive applesauce when you can make your own? Try this anytime you have an abundance of apples around! If you want a sweet treat that’s good for you too, get thee to the crock-pot and make this blueberry crisp. It’s crazy simple and tasty. Serve with a dollop of fresh yogurt. Brownie balls are even more fun than regular brownies and there’s no risk of burning! Make these in the afternoon so they’re ready for dessert. Use your slow cooker to make the easiest dessert ever. Use this fondue to dip fruits in for a “decadent” treat. If the scent of roasted nuts from street vendors has ever tantalized you, make this now! It’s full of healthy fats and a hint of honey sweetness. Homemade apple butter is simpler than you think when you do it in the crock pot! Put it on toast, dip crackers into it, or slather it on fruits. If you’ve never had cranberry sauce that doesn’t jiggle, it’s time to make your own. Luckily, with just four ingredients, it’s a snap. Serve this alongside your turkey around the holidays or with any roast! Haven’t cooked with figs very much? This is an easy way to introduce it to the family. Bonus: Make extra, store in mason jars, and gift to friends and family! An oven-free cobbler is possible! Pomegranate juice gives it some extra “oomph,” and it’s super easy to make in the slow cooker. Be sure to substitute coconut sugar for brown and arrowroot flour for cornstarch. With just milk and plain yogurt, you can make your very own Greek yogurt! If your family eats a lot of it, this is a great way to save money and involve the kids. Skip the preservatives and refined sugar by making your own ketchup. Serve this alongside roasted potatoes or grass-fed burgers for a taste you won’t find in the supermarket’s condiment aisle! When pumpkin’s on the brain, make this pumpkin butter to dip, well, everything, into — plus, this keeps for up to three months in the refrigerator. This healthy dessert can also masquerade as a sweet weekend brunch dish. Top with chopped nuts for extra crunch and nutrients. This is one of my favorite cold weather drinks. It’ll warm you right up and satisfy a craving for sweets! Plain applesauce tastes great but adding strawberries to the mix pushes it over the edge. It’s good enough to eat on its own, but it’s also yummy topped on toast. Use coconut or palm sugar in this to taste. You won’t believe this doesn’t have added sugar! Instead, fresh apples, lemon, cinnamon and vanilla give it all its flavor. This drinkable yogurt is perfect for kids and adults on the go. Plus, it’s fun to make! Mix it with fruit or granola to turn it into a healthy breakfast or snack.